After launching the SLS AMG 45th Anniversary edition a couple of weeks a go, Benz are announcing the SLS we were all waiting for, the Black Series edition. Eight month after the C63 Black edition, an SLS was a must. 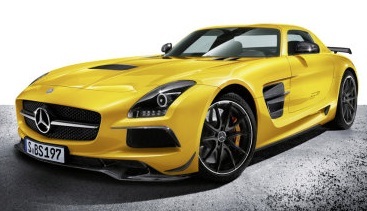 This new version of the famous SLS is not only road friendlier but also faster and lighter than the SLS GT. Does it have a screaming, shouting, ear fu**ing V8 combined with a whooping exhaust? Most probably. But this time the famous 6.2 V8 has been squeezed and now delivers 622hp and 634 lb-ft. The weight saving has been achieved thanks to the installation of light weight ceramic brakes, and lots of CRFP (Carbon fiber reinforced polymers) made parts here and there. 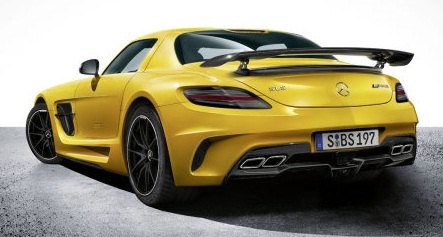 The end result is a Black Edition 70kgs lighter than the previous SLS GT. I really like the fact that this Benz includes a lot of features from the 45th anniversary edition while being a derivable comfortable car that you can take on a spin around the track on Sundays. The Solar Beam paint is very similar to the Electric Yellow of the MINI models. I really liked the color but I think that, as all Black Edition models, this SLS should definitively be featured in white. The ad by itself is nothing special, the intention of Mercedes was just to show there new creation to the world; just show it not listen to it. This entry was posted in CarAds and tagged 6.2 v8, 622hp, aerodynamics, ala amg 45th eanniversary edition, AMG, AMG Black Series Coupé, auto, automobiles, benz, black series, C 63 AMG Coupe Black Series, C-Coupe, C63, c63 amg black series commercial, c63 AMG commercial, commercial, Commercial C 63 AMG Coupe, Driving, high speed, luxury vehicles, Mercedes AMG, mercedes amg black series, Mercedes Benz AMG, new sls, new sls amg black series, Performance, racing cars, SLS AMG, sls amg ads, sls amg black series, sls commercial, supercars, yellow by JP Zakher. Bookmark the permalink.